What a shot from Root. He stepped across onto his off stump and reverse flicked the ball for four over short leg. Stunning creativity. Southee comes back with a clever slower ball and Root can't measure the pace. No run. Just three overs left and England are on 155-5. McClenaghan is back again and Stoke tickles his first delivery for a single. WICKET - Root is gone for 68. It was a slower ball from McClenaghan and Root mistimed it, squaring the ball high to Guptill at cover. Willey is the new man for England. This has been a good over from McClenaghan. Three runs and a wicket from the first four balls. Just two overs to go and Southee has been given the ball again. First ball goes for four, Stokes swats him through midwicket. Just a single through the covers on his next. WICKET - Willey is gone for six after hitting one straight up. Caught well by Santner, looking into the sun. Rashid is the new man in. Four. Stokes doesn't get it cleanly but it clears fine leg. Henry will bowl the Black Caps' last over. England on 177. Stokes slashes Henry through the covers for four from his first ball. Great fielding from Williamson to prevent a boundary on the second ball, diving at full stretch from point. Just a single. With English depth Rashid at 9, this will be a good game to win. Rashid opens the face and glides Henry for four past short third man. He tries to go again from the next ball but they only get a single. Stokes pulls Henry's last ball for four through square leg. 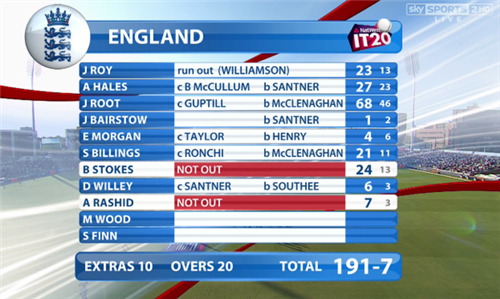 England finish with 191-7. I think England have reached what should be a par, or just below par score. This should be a compelling chase on a fine Manchester evening. Innings report to come shortly. The commentators were saying that 180 would be a good score for England. They have gone over and above. The bookies have England as $1.72 favourites to win now, NZ at $2.10. We are back underway with Guptill and McCullum at the crease. Guptill slashes Willey away for four off the first ball. Good start. WICKET - Guptill has been bowled. Great delivery from Willey. The ball swung back in to the right hander and he played all around it. Williamson is the new man in. McCullum smacks his first ball for four over mid off. What a cracking shot that is. McCullum hasn't opened the batting in T20 cricket for NZ since 2011. And second ball he is beaten outside off stump. 11 off the first over. An intriguing chase awaits New Zealand in the sole Twenty 20 international against England after the hosts opted to bat and made 191 for seven. This pitch looks a belter on a fine Manchester evening. It’s debatable whether their effort is a par score in the benign circumstances. 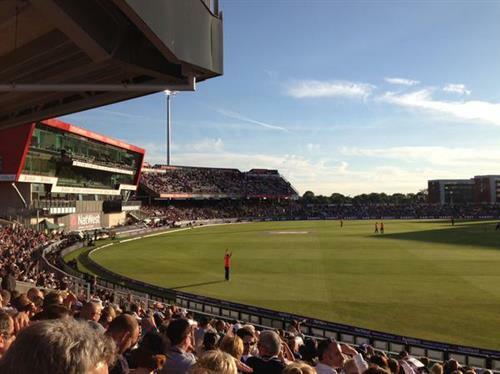 Given the time of year, daylight should last for the majority of the visitors’ innings. England went for their shots. The amount of fuel used to light flame throwers after any of the side’s six sixes reminded of Cape Canaveral on launch day. Regular wickets stymied the run flow although England had five wickets remaining with 25 balls left. Mitchell Santner was the pick of the bowlers with figures of two for 28, including nine dot balls. The delivery which bowled Jonny Bairstow was a candidate for pride of place on New Zealand’s innings mantelpiece. The hero from the fifth ODI misjudged the line and it hit the top of middle stump. Joe Root kept England’s cadence high for the majority with 68 from 46 balls across a 14.2 over span. Mitchell McClenaghan, returning in what might well be considered his specialist form of cricket, sealed the No.3’s demise with what appeared a slower ball bouncer. Root stretched for the shot and parried it to Martin Guptill at deep cover. McClenaghan finished with figures of two for 37 from four overs. A literal highlight of England’s innings was the new orange shirt of their strip. Various descriptions of the hue were suggested from US prison overall apricot to tangelo trajectory to zesty mandarin. One pondered what WG Grace might have made of the divergence from a more traditional red? Regardless, it was an explosive start from England's phosphorus match heads Jason Roy (23 from 13) and Alex Hales (27 from 23). Roy was run out by a Kane Williamson throw after Hales pushed a single to cover. Brendon McCullum made a running catch to extra cover look easy off Hales, giving Santner his first T20I wicket. Just to note Finn and Willey were putting in some serious practice on the ground about 2.5 hours prior to the match, long before any other player reached the ground. McCullum is on fire. He has just whacked a huge six over square leg to shoot through to 14 off 5 balls. Good start from NZ with 23 coming off the first two overs. McCullum is such a key wicket for England. Boom. Another six for McCullum. He now has three fours and two sixes and looks pretty damn good. McCullum is now on 21 off 9 balls. Williamson is the master at picking gaps and ticking the score along and does just that. NZ cruise through for two. 11 runs from that over. Wood into the attack now for England. Six more for McCullum. When he's in this sort of form there's not a lot you can do as a bowler. This time he charges and slaps it over midwicket. Another 6. This one over point. McCullum moves through to 34 off 12 balls.